Exaquantum is a PIMS (Plant Information Management System) software package that is one of the core components of MES (Manufacturing Execution System). Exaquantum is not only as a simple historian, but also a EUC (End User Computing) system for flexible utilization of plant information by the users. Moreover, the Exaquantum/Web function enables to meet market needs such as remote access and thin-client configuration. In the overseas market, PIMS is regarded as an essential component that serves the bridging function between PCS (Process Control System) and a corporate information system, so that many new major projects have started using Exaquantum. Improved plant operation efficiency and reduced maintenance costs based on appropriate predictive maintenance are the common objectives that need to be achieved in every manufacturing domain. Exaquantum is positioned above the Process Control System (PCS) layer and gathers and stores huge volumes of process and laboratory data over long terms. It is a software package designed to provide plant information as requested by the user, in a required form. Since its market release in April 2001, Exaquantum has recorded worldwide sales of more than 200 systems, which include the clients of Shell's East Zone refineries. This article introduces the enhanced functions of Exaquantum, as well as new technologies used therein. A "select-from-lists" method is provided for most configuration settings such as system definitions, data acquisition definitions, calculation tag definitions, and others. Consequently, users can set up system easily. Exaquantum automatically produces data on the maximum, minimum, average, standard deviations, summation, and spot value of closing time within the server with correspond to the defined period of aggregation, and stores and manages those data. This means that clients do not have to perform primary data processing and Exaquantum/PIMS server can store any modifications made to the aggregation data. Exaquantum can acquire and accumulate event messages generated by a PCS. It stores and manages event information as well as process variables. By uploading data stored by Exaopc, an OPC server from Yokogawa Electric, data dropouts during an Exaquantum/ PIMS shutdown can be supplemented. Thus, the catch up enables to ensure complete historical data. An Exaquantum/PIMS has the capacity of 2,000 data items/ server. Therefore, the Exaquantum/PIMS can increase the capacity to 100,000 data items by putting a maximum of five Exaquantum/PIMS servers in concurrent operation. The equivalent services (reference and setup) to those provided by the Exaquantum/Explorer client have been realized using a general-purpose Web browser (Microsoft Internet Explorer 6.0). Exaquantum is a client-server type software package consisting of Exaquantum/PIMS (server), Excel Add-In, OLE- DB and Exaquantum Explorer (clients). Figure 1 shows the basic configuration of Exaquantum and Table 1 summarizes hardware requirements. 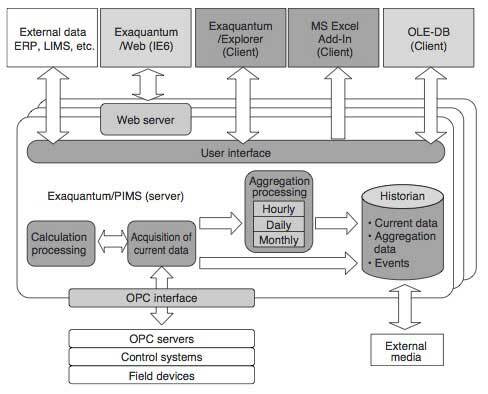 Using OLE for Process Control (OPC) as the interface, Exaquantum acquires data from the process. While conventional PIMS packages are designed to execute fixed-interval polling, Exaquantum/PIMS takes the method of receiving change-in-data messages from the OPC server using an asynchronous interface. With this method, it is possible to reduce the amount of steady-state load and minimize the volume of acquired data (archival data). For the data sources which are not supported by OPC, manual tags (manually input data) are defined in Exaquantum/PIMS. Then data is written to the tags manually or using an application program interface (API), in order to acquire data from the sources. Alarms and events can also be acquired from the OPC server through asynchronous interface same as process data. Exaquantum/PIMS provides a calculating environment that can be defined by users within the server. By defining calculation tags, it is possible to define VBScript-based calculating expressions (four arithmetic operations, an exponential operation, a logarithmic operation, a character string manipulation, etc.). The types of data that can be referenced are all realtime data that Exaquantum/PIMS stores, and aggregation data that was previously aggregated. Thus, users can freely define desired calculating expressions. Exaquantum/PIMS implements aggregation processing in itself. Users can create aggregation data by simply specifying the aggregation period and data type (i.e., average, summation, maximum, minimum or standard deviations for contiguous values or the frequency of change to the specified status or the total time of the specified status for noncontiguous values such as status). Exaquantum/PIMS stores messages created by a PCS same as process data. The alarm and event server (A&E server) of the OPC server is used to gather these messages. The gathered messages are stored in separate tables on a message type basis. MS-SQL server is the internal database of Exaquantum/PIMS. Users can filter and analyze the messages using the query wizard. Process data gathered and accumulated by Exaquantum/ PIMS can be accessed from client functions such as Exaquantum/ Explorer, Excel Add-In, the OLE-DB interface, or a Web browser. With Exaquantum/Web, users can refer to or set up data stored by Exaquantum/PIMS using a general-purpose Web browser (Internet Explorer 6). This function enables to install clients without being restricted by the network configuration (fire walls, domain boundaries, etc.). In addition, users do not have to install client functions in each client PC. Accordingly, the Exaquantum/Web function works very effectively in cases where clients are distributed widely. The Exaquantum/Web function supports scalable vector graphics (SVG) in order to show plant configuration graphically. Employing SVG has enabled to convert images from the graphic windows of CENTUM CS 1000 or CS 3000 to Exaquantum graphic windows. The template concept has been introduced to Exaquantum/ PIMS, in order to define tags and function blocks. Templates are general-purpose models and their entities are defined by their ability to be referenced. This strategy minimizes the number of items to be defined for each individual entity, dramatically reducing the engineering manpower required for such definitions. Users can obtain values, timestamps and quality codes for each data items from the OPC server from which Exaquantum/ PIMS mainly acquires data. Of these data items, the quality code indicates data reliability and has three qualities—Good, Bad and Uncertain. The quality code, which can be referenced within Exaquantum/PIMS, is further transferred to the computation results. Quality codes are also generated for aggregation data over a timeframe appropriate for each aggregation period. For example, if the ratio of the original data being "Good" for a given aggregation period is 100%, then the aggregation data is also labeled "Good." If the ratio is lower than 100% but higher than a specific setpoint (85% by default), then the aggregation data is labeled "Uncertain." If the ratio is lower than the setpoint, the aggregation data is labeled "Bad." Quality codes enable users to handle the acquired data effectively in a detailed manner when utilizing it. Note that aggregation data is only produced for data whose quality code is other than "Bad." Exaquantum/PIMS can support multi-server systems for a large-scale system. Data lists are equalized between servers so that users can gain access to data without having to be aware of which server the data exists in. Requests from the Exaquantum/ Explorer client are transferred to the server in which the data actually exists, thus enabling access to the entire range of data. In other words, the system can be regarded as only one server— Exaquantum/PIMS. Role based name spaces (RBNS) are designed to define restrictions on data access according to users' roles. 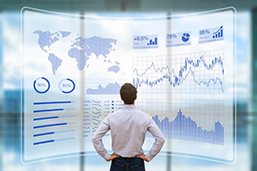 An optimum operating environment is provided by displaying only such data as necessary for each user's role. In addition, security can be ensured by making data inaccessible that need not be accessed. Exaquantum takes advantage of Windows' log-in account so that the range of data that can be displayed for each Windows user group is restricted. Thus, it is possible to control the range of access by determining which user should belong to which Windows user group. When Exaquantum/PIMS is started, this function captures data from the historical data access (HDA) function of Exaopc to supplement data that has dropped out during Exaquantum/PIMS shutdown. Consequently, even if Exaquantum/PIMS has shut down, it is possible to refer to complete historical data after the server has been restarted. This function also supports aggregation processing, as well as the processing of alarm and event messages, enabling users to restore a complete operation history. In the future scope of Exaquantum development, we will enhance its collaboration with MES applications and build a lineup of commonly used key applications. These applications include the analysis and reporting application for batch processes (Exaquantum/Batch) and a family of management applications (value-added information sourced applications [VISA]) that enable mass balancing and performance monitoring based on plant models. By establishing a lineup of such key applications and combining them, we will provide solutions that continue to meet user requirements. Exaquantum and Exaopc are registered trademarks of Yokogawa Electric Corporation. Other names of products and models that appear in this document are the trademarks or registered trademarks of their respective holders.